Two Britons are among at least five people killed after a huge storm triggered flash floods on the Spanish island of Majorca. A British couple were reportedly in a taxi swept away by a torrent of water in the town of Sant Lorrenc des Cardassar, about 40 miles east of the capital Palma. Antonia Bauza, the deputy mayor of Sant Llorenc, confirmed two of the victims were British nationals and said their taxi driver was missing. She told local radio that two other victims were local, including an elderly woman whose body was found in the basement of her house. The fifth victim died in the town of S’illot. More than 200 residents were evacuated from their homes overnight, while others sought refuge from the floods on their roofs. Spanish authorities said 80 soldiers would join more than 100 rescuers working in the area. 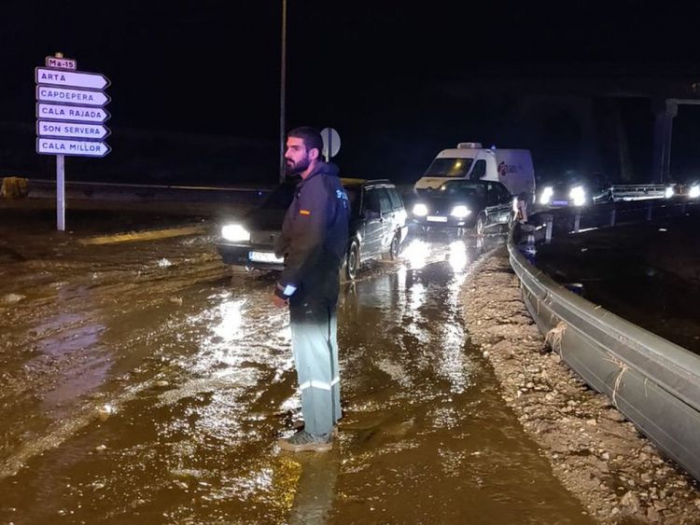 The Spanish weather forecasters said 8in of rain fell in four hours, causing what social media users called “biblical” floods.